"Excellent information for the curious 'cook' ..."
Dredging is a process in which foods are pulled through dry ingredients, such as flour, in order to coat the food before cooking. Flour can be used alone as a coating, but it is more often combined with other dry ingredients such as herbs, spices, salt, or breadcrumbs to create a seasoned coating on the food that becomes brown and crispy after it is cooked. 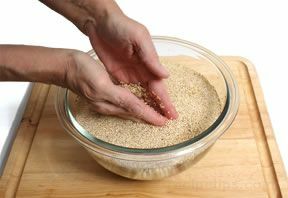 Fish fillets, boneless poultry, pork cutlets, and veal cutlets are some of the foods that are often dredged in flour and other dry ingredients before cooking. There are several reasons for dredging: the coating applied to the food acts as a barrier that keeps the food from sticking to the pan as it cooks; it enables the exterior of the food to become crisp and darken evenly without burning; and it prevents the texture of the food from becoming tough. 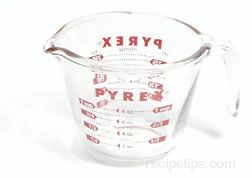 The flour and the other dry ingredients should be placed on a food mat, paper towel, shallow pan, or a large bowl. 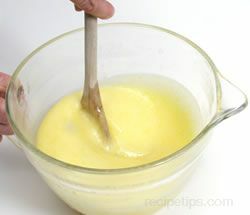 All of the dry ingredients can be mixed together and then the food can be dredged through the mixture. An alternative method is to first apply any seasonings, such as salt, pepper, herbs, or spices to the food and then dredge the food in flour. This procedure enables each piece of food to be prepared with the desired amount of seasoning, rather than relying on the seasoning to be evenly distributed in the coating mixture. Before dredging, the food should first be lightly dried. Pat the food with paper towels to absorb excess moisture. The food should be dredged through the flour on all sides, providing an even coating over the entire piece of food. It is important that the food not be heavily coated, but the application of a light, even coating will insure that the food achieves a golden brown appearance and a tasty coating when cooked. The coated food should not remain sitting too long before cooking, which could make the coating soggy, preventing the food from cooking effectively. 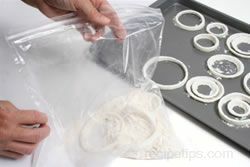 Another method for coating foods with flour is with the use of a large bag. Simply add the flour and seasonings to the bag, insert the food, and shake the bag or roll the food in the bag to coat the food. 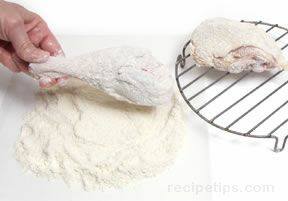 When coating larger foods, it is best to coat one piece at time, such as when coating chicken pieces for frying. 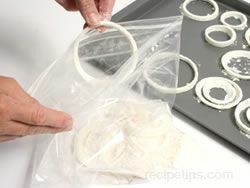 When coating smaller foods, such as onion rings, several pieces can be coated at one time. Large plastic kitchen bags work the best and some people prefer paper bags. It is important to make sure that whichever type of bag is used that is be a bag intended for contact with food. Some bags that are not usually associated with food handling may contain dyes, glues, or other chemicals that may be absorbed by the food.